As one of the most successful Canadian rock groups, Nickelback has sold more than 50 million albums worldwide…that’s a lot of albums, folks. They rank eleventh as the best selling music act and the second best selling foreign act in the United States (of the 2000’s) behind the Beatles. 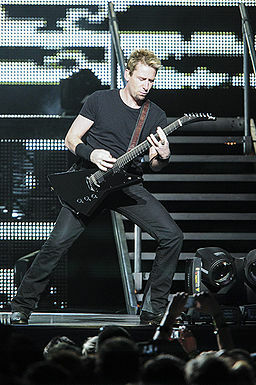 Currently, the band is comprised of lead vocalist and guitarist Chad Kroeger..backing vocalist, guitarist, keyboard player Ryan Peake..bassist Mike Kroeger, and drummer Daniel Adair. Based in Vancouver, their hit songs include “How You Remind Me” (released in 2001, it remains Billboard’s Top Song Of The Decade), “Someday”, “Photograph”, “Far Away”, and “Rockstar”. Book now at 1825 Inn Bed and Breakfast right next to Hershey PA….The second sweetest place on earth!